I’ve been lucky to enjoy a number of great mornings (here, here and here) in the mountains as summer has wound down. Last weekend I went to Kananaskis to see how the autumn colors were coming in at the higher elevations. I went to Wedge Pond ahead of the sunrise and waited for the darkness to lift. Soon enough it did, and quickly, revealing the larch along the shoreline were starting to turn but there were more lime greens than yellows and golds. I’ll be back again in a week or two to try to catch the stands of gold before the needles fall and the leaves blow away. I was not disappointed in any way though. 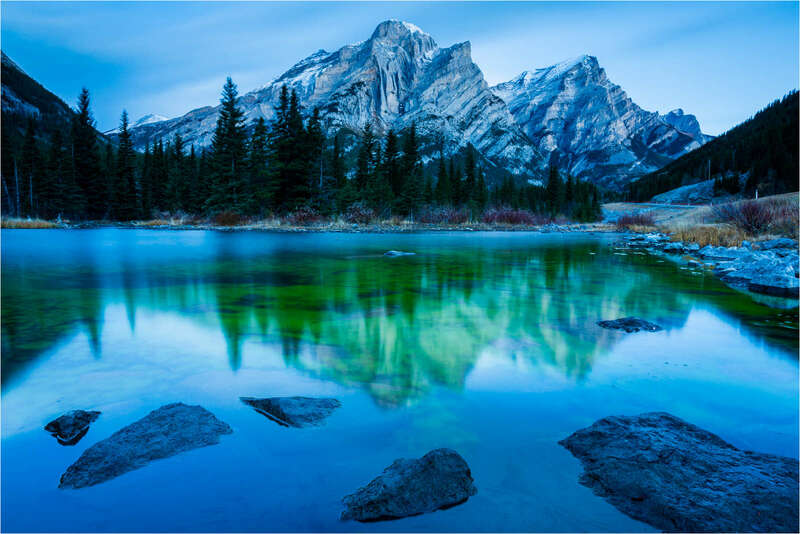 The mist swirled across the calm water, drawing a line through the middle of the mountains and their reflections as the early morning blue gave way to the alpenglow. 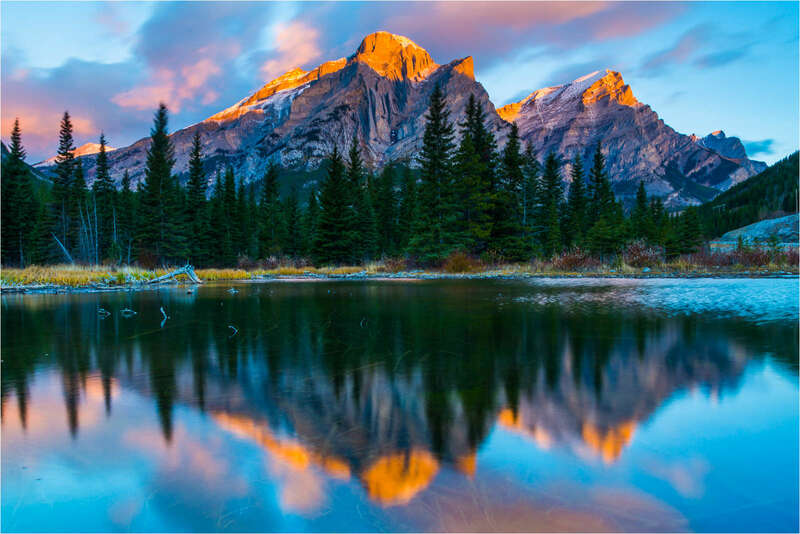 Wedge Pond is a favourite location of mine in Kananaskis Country. 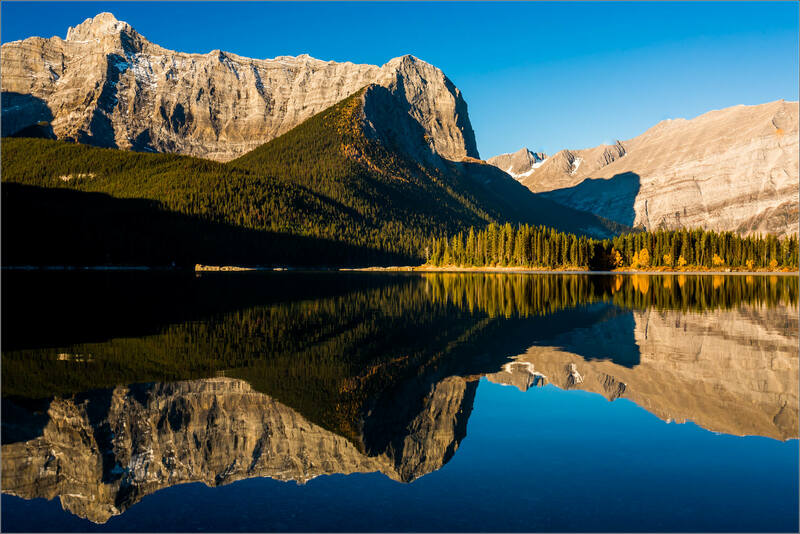 She sits below the massive chunk of rock that is Mount Kidd and in calm moments mirrors the entire mountain on her surface. Several more peaks along the Kananaskis River Valley are prominent from the shoreline as well. Collectively they provide a lot of visually appealing elements to work with when photographing around this little lake. I usually head there in late September when the aspen trees around the pond turn a brilliant yellow (previous posts with those images). 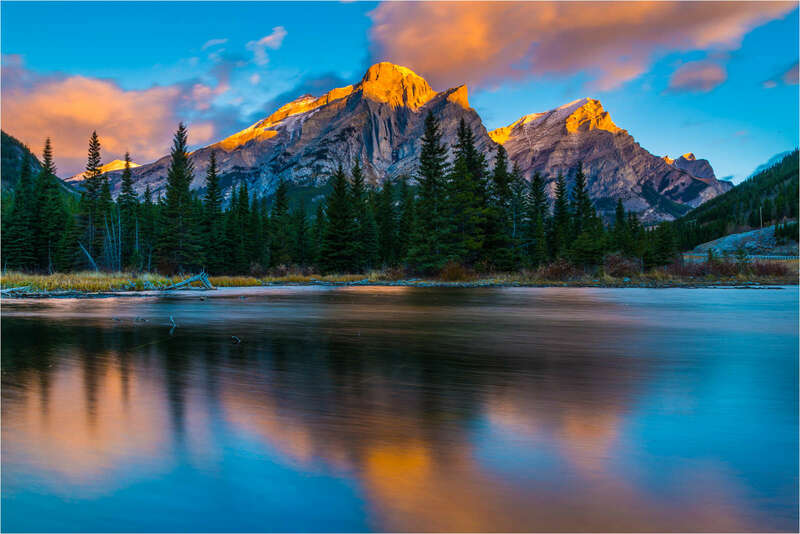 A couple of weeks ago I was contacted by a friendly Australian photographer who will be coming this way next month and was looking for some local information about Kananaskis and Wedge Pond in particular. That got me thinking about Wedge a little earlier than usual and I headed up in the wee hours on August 11th.. The mist was swirling early. Cold, humid air and a gentle breeze combined to push the mist across the water. On this day, the sky was clear and the alpenglow was visible above the mountains early and then slid down the surrounding peaks. The morning exceeded all expectations I may have had and I was blessed with an amazing start to the day. The red that first painted the peaks was soon washed over with golden sunlight and I headed up for a hike at Chester Lake. On my way up to the mountains this weekend, the sun continued its struggle with the smoke from the wildfires. In the early evening I made my way along Highway 40 and stopped several times to watch the clouds and sun in this unusual scene. 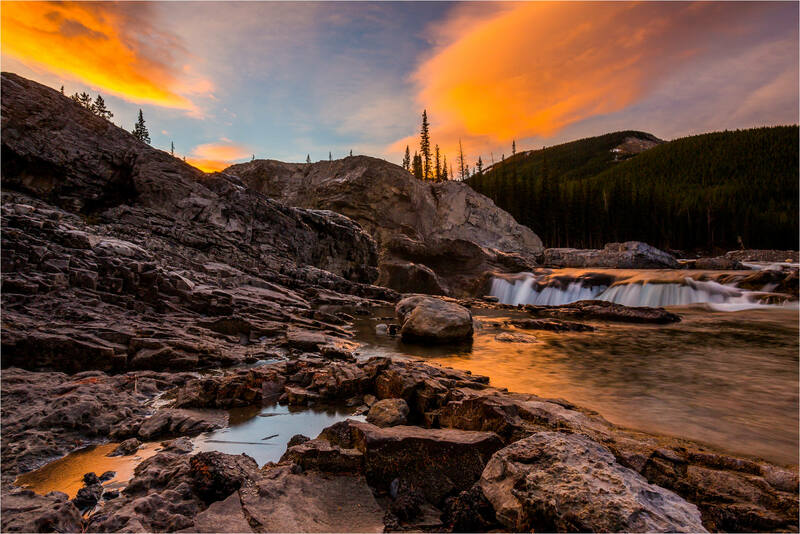 I ended up on the shore of the Upper Kananaskis Lake about an hour before sunset. It was a warm night which I was grateful for – even in summer the wind can blow hard and cold across the lake at anytime. Over the next couple of hours a loon, a few people fishing and one large, extended family came and went. I moved down the shoreline slowly, taking photographs of the sun’s descent towards the jagged silhouette of the mountains the curve around the lake. The smoke acts like a neutral density filter and drops the intensity of the sun’s light considerably. That allowed me to spend a lot of time exploring how the atmosphere, the sunlight and the landscape could be composed. All three changed in appearance and shape as the sun descended. 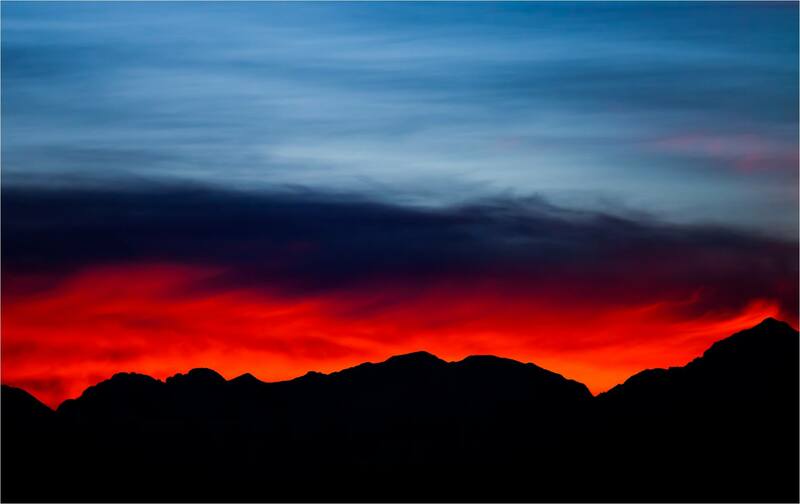 When the sun drew close to the mountains, the colors deepened and the silhouettes of the mountains were fantastic against the sky. 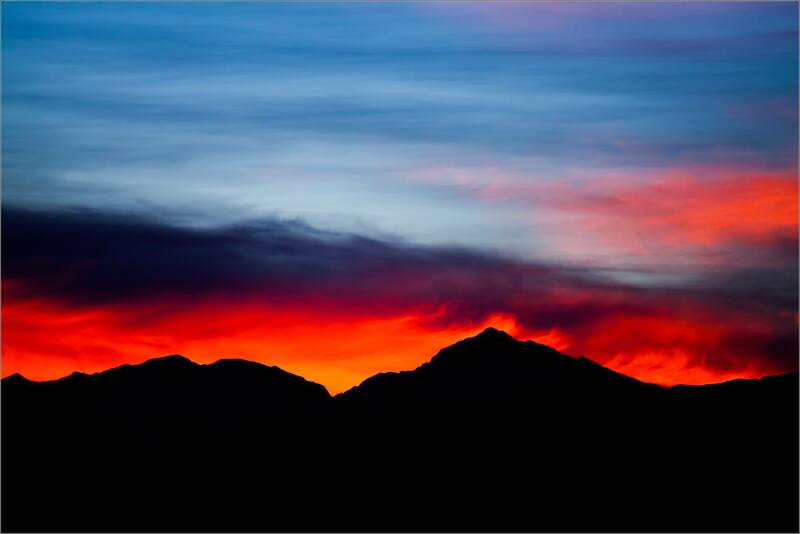 The fiery hues disappeared quickly once the sun fell behind the mountains. That left cooler tones to quietly take hold. At that point, I was alone on the shore and the tranquility held me there for a long while. Last weekend I spent the morning looking for wildlife along the Bow Valley Parkway in Banff National Park. I drove along, stopping several times for short hikes to get a view over the river valley or along a creek into the forest. None of the animals graced me with their presence but the land made it a good morning nonetheless. 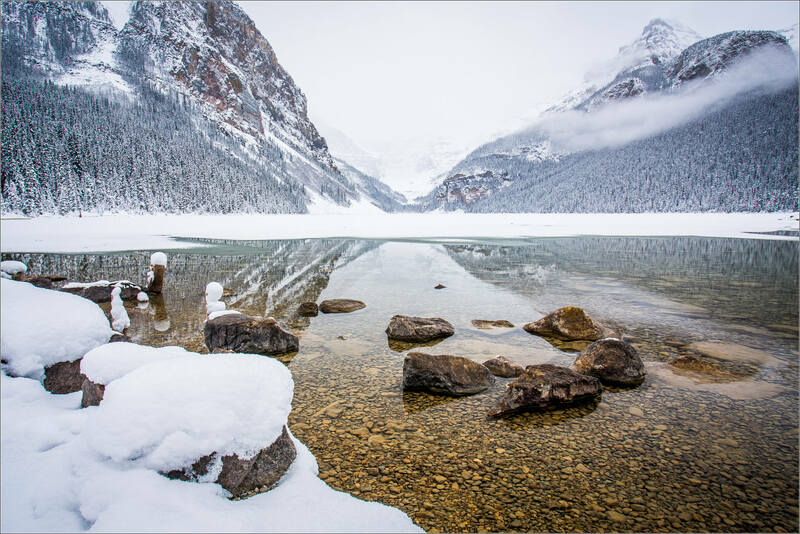 In Banff, the lakes are frozen but there was very little snow on the ground. Halfway towards Lake Louise, the snow was more prevalent and when I got to the lake, the trees were heavy with snow, the ground was well-covered and winter was firmly set. It has been a couple of years since I wandered along the lake shore in winter with camera in hand. I enjoyed the time, working to create some images while listening to the multilingual hum from the other visitors as they came and went. It was a good time to be up there to photograph. The snow was falling gently, the river that drains out of the northeastern end of the lake was yet to freeze over and the clouds were moving fast so the peaks were in and out of view. Lot’s of dynamic elements to weave together into a variety of images. This was my favourite from a relaxed morning doing what I love. 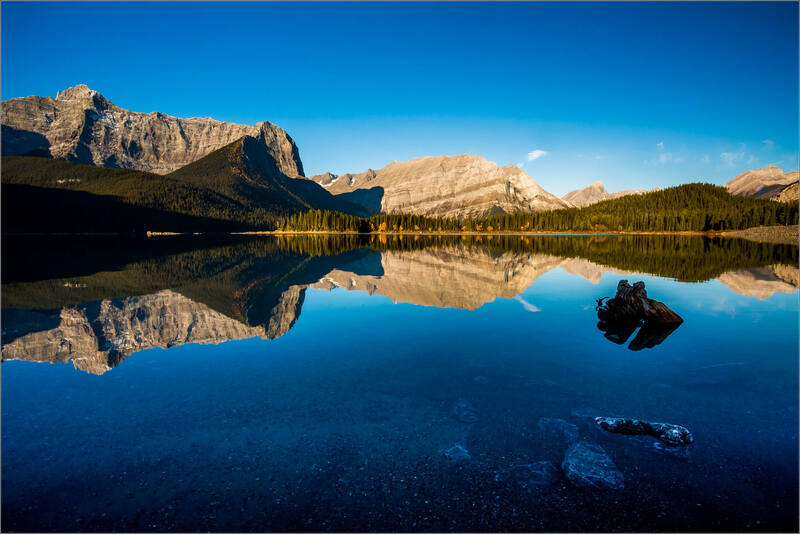 I started a great day in Kananaskis earlier this weekend walking along the shoreline of the Upper Kananaskis Lake in the Peter Lougheed Provincial Park. 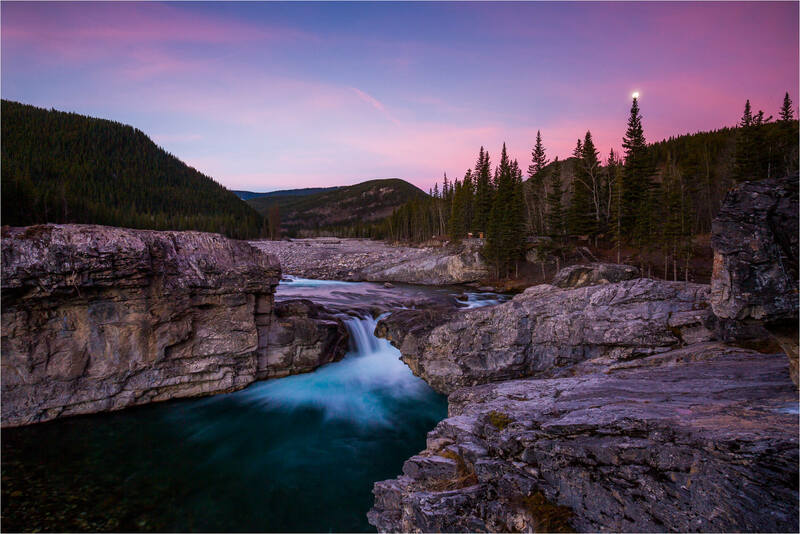 At sunrise I was photographing a pair of moose, a mother and her calf, in a meadow and I ended up spending most of the morning at the Sarrail Falls. However, when I parked near the boat launch at the lake, the soft light, subtle autumn accents, calm water and brilliant reflection of the mountains in the water mesmerized me for several minutes. I had the lake to myself for a little while and enjoyed the beauty immensely. 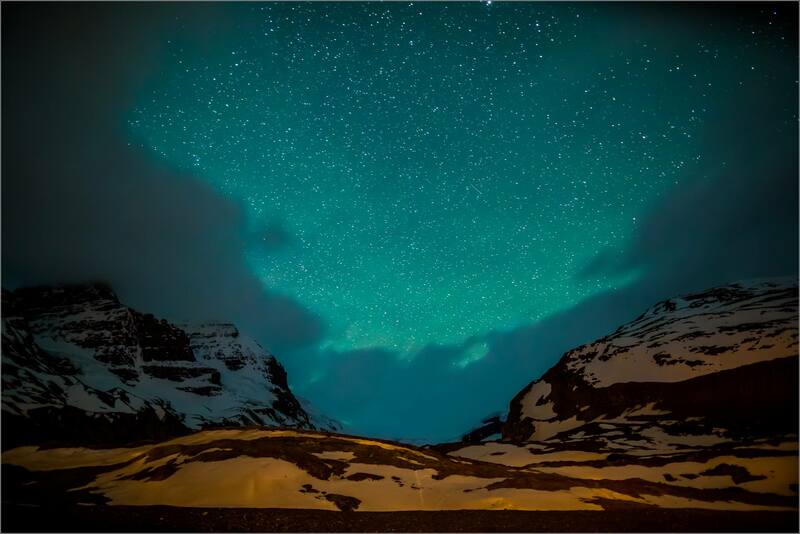 When I ventured up to Jasper National Park in May, I spent the first night at the foot of the Athabasca Glacier. After laying my sleeping bag across the reclined passenger seat, I set up my tripod and camera along one of the trails that lead up to the edge of the ice. Looking up the glacier, between the clouds as they slid by, a subtle green-blue glow was visible above the ice, rock and snow. With long exposures, the glow was more pronounced. I first thought it may be the Aurora Borealis but I was facing towards the southwest so I would have expected a show behind me more than where I was looking. It was a new moon that night so I’m not sure was responsible for the glow. 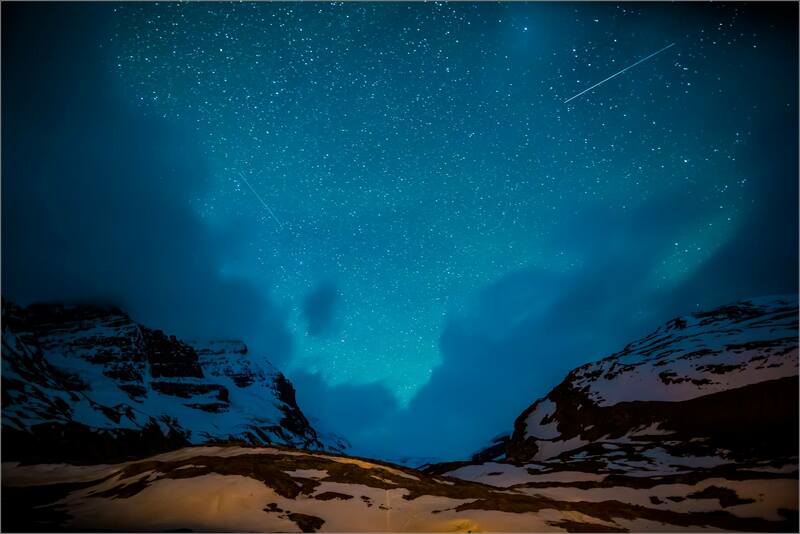 Could it be the starlight on a clear night, free from light pollution, reflecting off of the ice? Maybe, but I really can’t explain it. 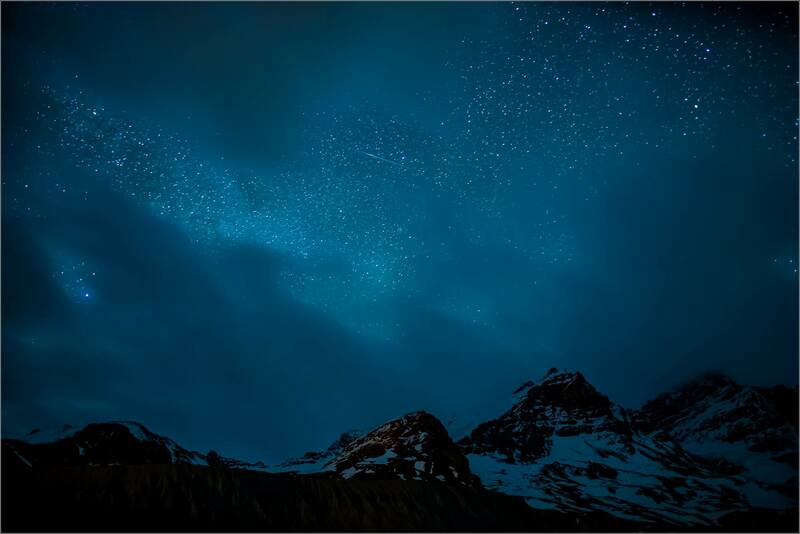 It was hauntingly beautiful and I enjoyed spending a couple of hours in that place within this immeasurably vast universe – a night with the stars will get you thinking such things! 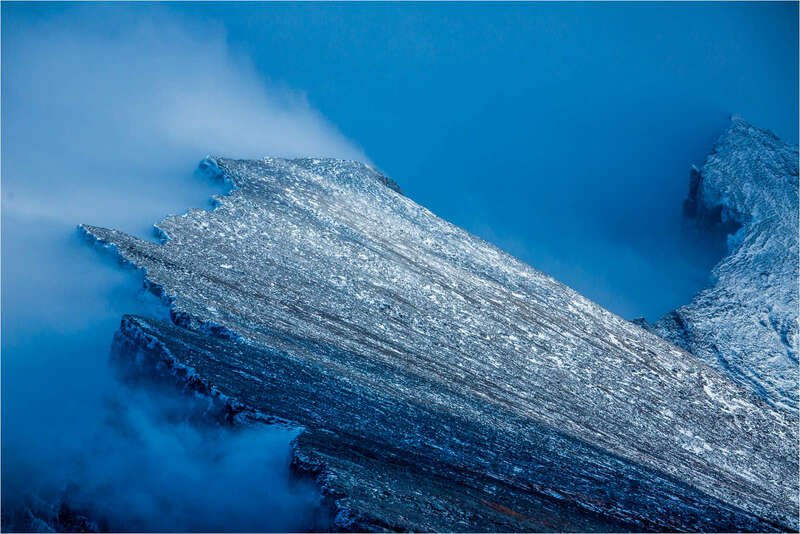 It was a great auditory experience as well, the ice cracks and rock falls echoed off the mountains and down the glacier field irregularly through the night which broke up the steady cries of the racing winds. 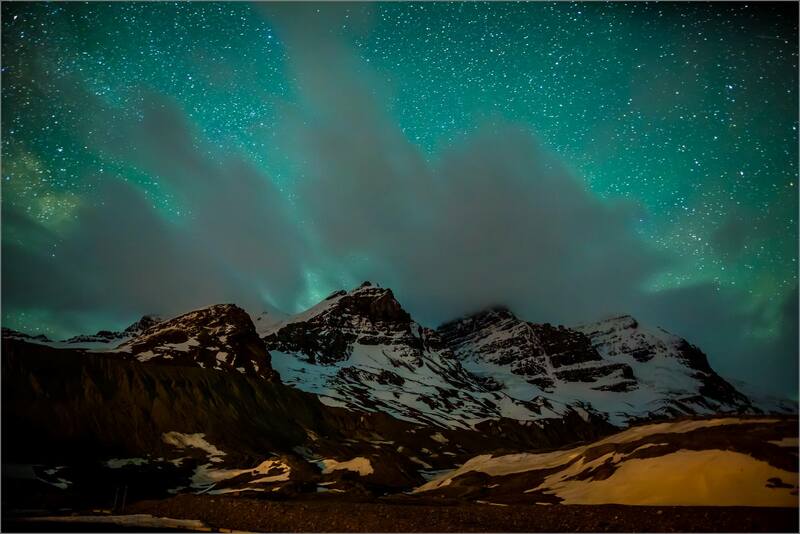 Sparkling stars, blurred clouds, glowing skies and jagged peaks – it was a special night. 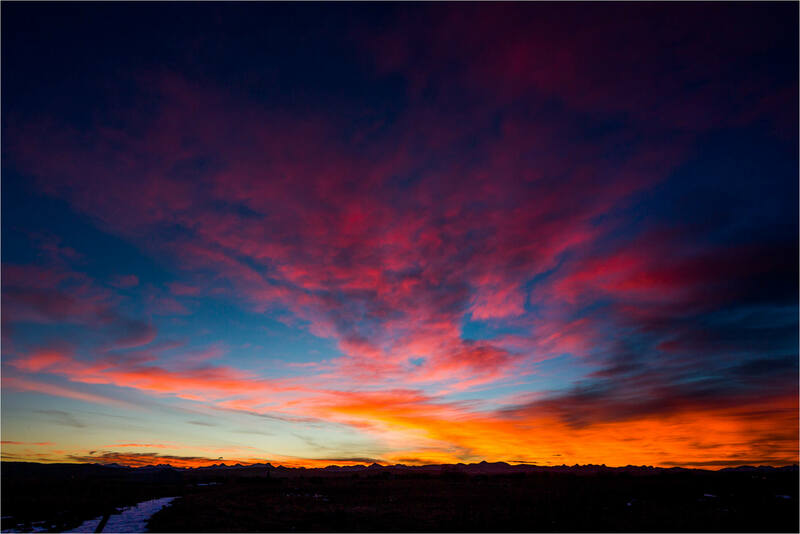 During the chinook of the last few days there were several beautiful sunsets that I took time to enjoy. 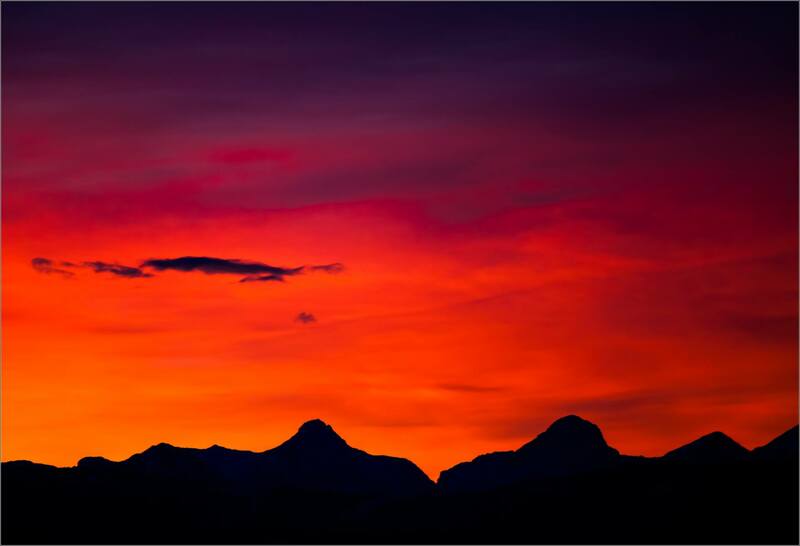 Looking west at the Rockies is one of my favourite skylines and their silhouette at dusk often adds immensely to a landscape photograph. The chinook ended last night with the arrival of a snowstorm which continues this morning. I’m not too dismayed, it was nice to have a break of warm weather in the middle of winter. 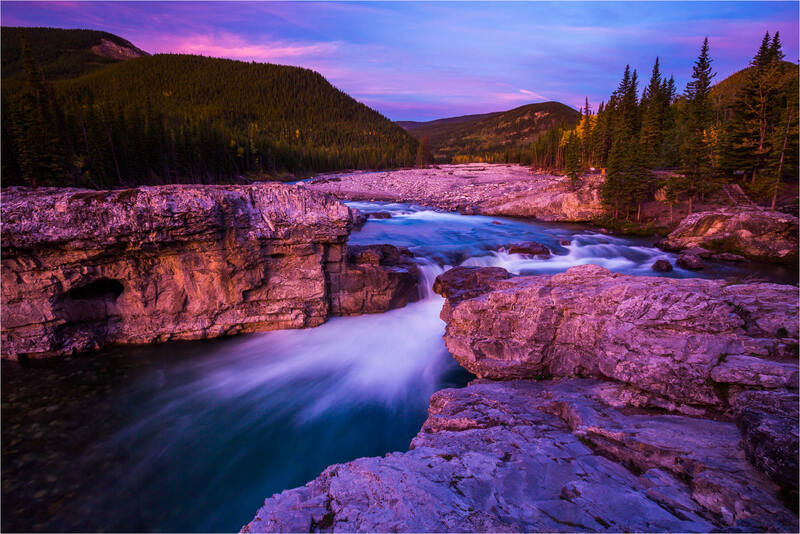 The early light worked well with a few interesting clouds hanging above Elbow Falls on the day I was up there this weekend. The soft pink ahead of sunrise shared the sky with the waning full moon early. 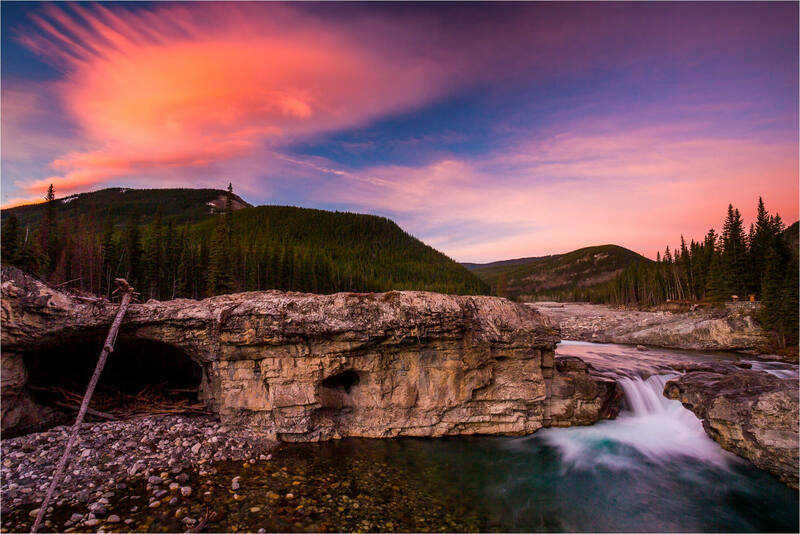 As the clouds turned to a deep peach color I moved just above the waterfall. From there the reflections of colour on the excited water were beautiful and I watched the morning open up. 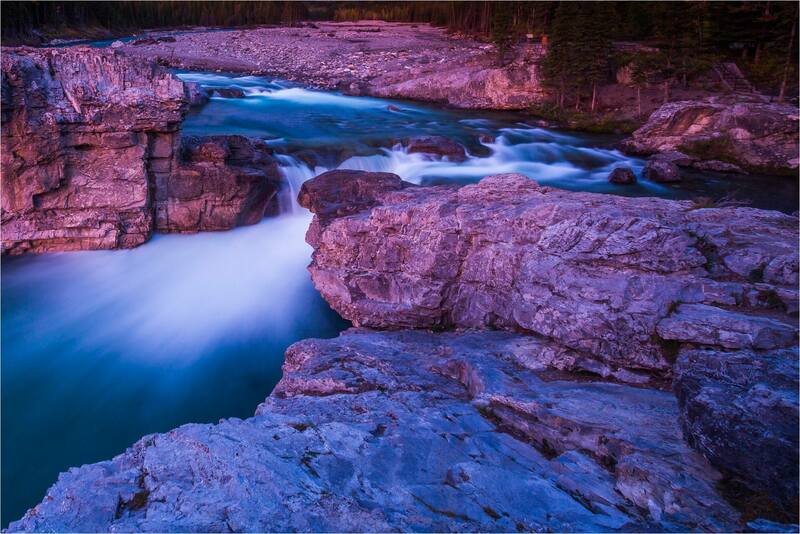 A cold morning greeted me at Elbow Falls yesterday. I set up from a rocky perch above the river and enjoyed watching the day come in. The clouds above caught the early pink light while the land below was gently brushed by the alpen glow that preceded sunrise. We stayed at Lake Louise a couple of weeks ago and I set up to take some photographs from my room of the ice sculptures lit up around the front lawn of the Chateau. It was then I noticed the stars and how wonderfully bright they were. With the reflection of lights from below there was a lot of distortion, refraction and general murk to wrestle with. The hazy arcs above the mountain are one of the interesting effects from the lamps around the pathways. 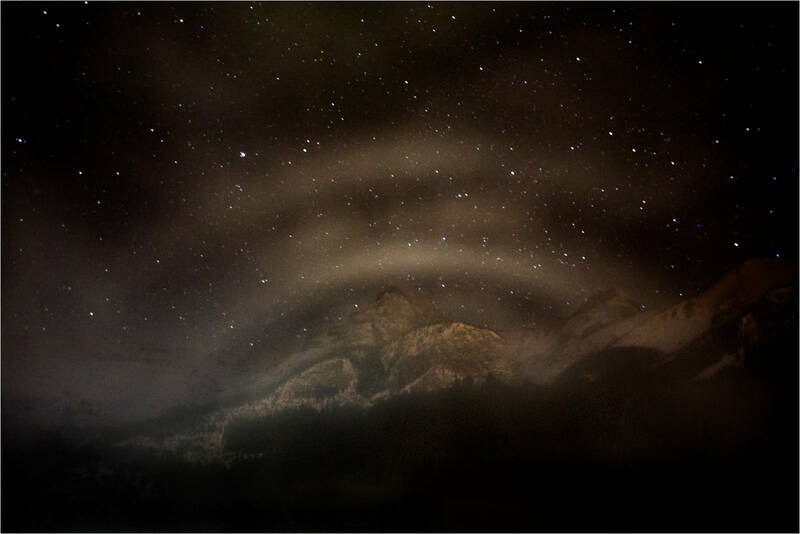 I worked away for a little while and liked this somewhat abstract image of Mount Whyte under the night sky. Wind blows snow off of Mount Rundle’s eastern peak. This was the vanguard of the storm that brought snow out onto the prairies over the weekend. My friend and fellow photographer Jeff Rhude and I made it up to the reflecting pools which provide a beautiful mirror for Mount Kidd while it was still dark. While dawn was still only a bit of light to the east, I used an exposure just a bit over two minutes long to see this early morning. The wind was blowing in short blasts as we were waiting and once it was brighter I took an opportunity to show a bit of that in the blurred water.